Versatile nonfiction author Budiansky (Air Power, 2004, etc.) 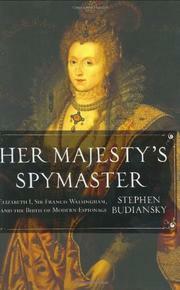 takes on the career of Elizabeth I’s wily Puritan ambassador, in an occasionally clotted but ultimately riveting study. Walsingham was one of the new generation of university-educated laymen from the gentry (rather than nobility), men of the Renaissance Enlightenment whom Queen Elizabeth I sagely kept around her, the other two being William Cecil (Lord Burghley) and the Earl of Leicester. Promoted by Cecil as Elizabeth’s ambassador to France, where he nearly lost his life during the ghastly Bartholomew Massacre of 1572, Walsingham quickly ascended to the position of Principal Secretary, a job he largely created himself. A polyglot and master of discretion, Mr. Secretary, as he was known, had to “understand the state of the whole realm” as well as take the blame from his irascible queen when something went wrong. Walsingham, whose motto was “Hear all reports but trust not all,” built up a network of “paid scoundrels” to infiltrate Catholic circles, being faced continually with crisis after crisis involving the conniving Mary Queen of Scots and her sympathetic Catholic followers. Walsingham finally engineered a conspiratorial web around Mary that caused her to betray herself in correspondence, and the Babington plotters were caught. A hard-liner, Walsingham pushed for Mary’s execution, and, despite Elizabeth’s vacillation, the warrant was signed and Mary executed in 1587. Further, Walsingham warned of Spain’s recalcitrance and, overcoming Elizabeth’s “perfected art of tactical delay,” saw the triumph of the English fleet over the Spanish Armada. Budiansky gets bogged down in detail at the start, as he opens his story in Paris with the first attempted murder of the Huguenot leader Coligny just prior to Bartholomew Day, then stepping back to fill in the picture. The result is a satisfying and shrewd portrait of a key historical and very human figure. For both scholar and lay reader, a historical study that makes us wish for more like it on subjects too often only glanced at.